SEA EAGLE NeedleNose™ 116 は長さ 351 cm、幅 76 cm 、厚み 15 cmですが重量わずか10.8 kgです! I loved everything so much, l bought 2 more! Portability is awesome along with durability and stiffness. It definitely feels like a hard board. Got my SUP before it was really warm enough to use and the first time out failed miserably a trying to stand, kneel, or sit on the board without falling off and even more miserably at getting back on the board once I was off. A little late I decided that I needed some instruction and there is a wealth of it online with articles and videos. A few videos later and a calm day on the river, I did much better. I need to explain that none of this had to do with the board which is exactly as advertised and a great product. The problem was me. 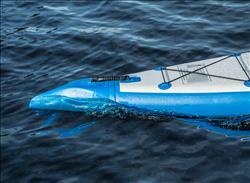 I originally bought the Hybrid 9'6" but I don't think I was strong enough to paddle it in a straight line. So then I got the NN116 and I absolutely love it. I take it in the ocean and in the harbor. As I am still learning, I prefer harbor as the water off Malibu can be rough. I am in my mid 60's agewise, and 5'5" 145lbs. I can carry it very easily. It is effortless to paddle. I bought an electric pump and battery and it really helps to get it into the water quickly. Unfortunately, I have been laid up with a bad back for the last two months, and my SUP days are over for a few more months. I had it rolled up as I was going to take it to the Caribbean, and the needlenose part looks like it needs a padding, just like the fins have, or else it can damage the hull. The needlenose is quite sharp. It is still rolled up. Should it be stored rolled up or blown up? I am too unwell to look up that info. 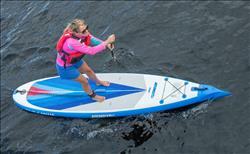 This is a great SUP Board and my family in Scotland, Italy and Dubai will probably want one too. I received my boat on time, well packaged, easy to unpack and figure out except that I had to look at a Sea Eagle video about how to work the valve twist and pop feature. I don't think of my hands as weak, but I couldn't work the valve without a gardening glove on, so I added a glove to the backpack. It also took me a while to figure out how to hook up the tubing to the pressure gauge, pump, and boat. These are not long term concerns -- once you figure it out, you're good. Our whole family loves this SUP. It's so convenient! We use it on the neighborhood lake and take it camping. This is our 3rd Sea Eagle purchase. Love all of our inflatables. Just wish it came with an ankle leash (purchased separately).